It’s easy to feel self conscious about your smile when you’re missing one or many teeth. Missing teeth cause gaps in your smile, and you may not feel as inclined to share it with the world. This can hold you back in professional and social settings alike. If you’re tired of hiding your smile, it’s time to replace your missing tooth and start smiling again. Dental prosthetic options like a dental implant allow you to do just that. Dental implants are strong, reliable, and recreate the appearance of your original tooth. You actually have a number of prosthetic dentistry options when choosing a replacement tooth. Options like dental bridges and dentures have value, and in certain situations they may be the right choice. However, dental implants are the strongest prosthetic choice, and that’s because they can stand on their own. Dental implants are surgically placed in your jaw, so they don’t need other teeth to hold them in place. A dental bridge uses neighboring teeth for support, so if those teeth suffer damage or begin shifting, it can affect the stability of the bridge. Another huge advantage that dental implants offer is their stability. Your dental implant is made of biocompatible titanium, meaning it will hold up over time. The post is surgically placed in your jaw bone, so it acts like the roots of a tooth. 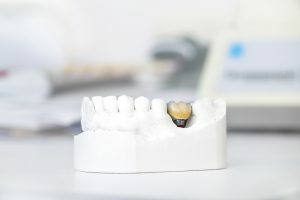 You can reliably use your implant like you would a normal tooth. Your bite power should remain relatively unaltered from when you had your natural tooth in place. This isn’t always the case with other prosthetic dentistry options. If you’re looking for a durable replacement option, an implant is the way to go. While a titanium post is sturdy and reliable, it doesn’t exactly look like a tooth or provide the bite surface that a tooth would. After placing your implant, your dentist will fabricate a dental crown. Crowns are made to look and fit like a natural tooth. (They typically cover vulnerable teeth that have suffered damage.) Your dentist will place the crown atop the dental implant to give you a natural-looking finish to your implant. Implants truly offer a comprehensive recovery from adult tooth loss. Tooth loss isn’t easy to cope with. You don’t have to continue hiding your smile. You can restore your missing teeth with dental implants. Michael Flynn has taken numerous continuing education courses and attended conferences relating to dental implants. If you want a trusted dentist to place your dental implants, talk to Michael Flynn Dentistry. You can schedule an implant consultation by contacting Michael Flynn Dentistry in West Allis, WI at 414-541-8250.